VENONORM tabs - De website van capricornlifesciences! 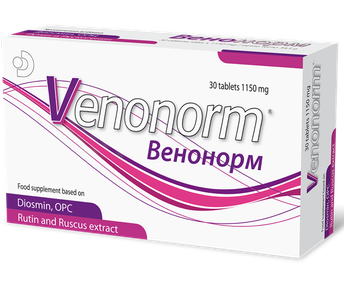 VENONORM tablets is a combination of natural elements, is based on purified bioflavonoids, Diosmin, Rutin, Ruscus aculeatus, Solidago and OPC which enhances the microcirculation of the lower limbs, the normal venous circulation of the hemorrhoidal plexus and helps the drainage of body fluids. Venonorm can be used in early therapy and prophylaxis of Chronic Venous Insufficiency (CVI). Venonorm is also used for oedema and symptoms associated with chronic venous insufficiency (painful, tired, heavy, swollen legs with cramps and paraesthesia) (Food supplement).